Description: RG 311 grinds westward on the CP River Sub as it comes up to Weaver, MN. While it was cool to catch a grinder in action, it was also a little bittersweet. Description: The B&LE Trio roars north towards Keenan with a train of empty taconite hoppers in tow. This was worth the trip, and the timing for this was perfect in every imaginable way. Description: When it snows the railfans come out and make the best of the conditions! Here we see a four pack of BNSF C44-9Ws racing west at Osborne Road in Fridley MN in near blinding conditions. Description: CP 5775 leads B27 up Stockton Hill as it leans into the curve and tackles the stiff grade. Description: Thanks to a broken rail, I was able to catch up to 270 at Maple Springs after sleeping in a little bit. The train had a very bad time on the River Sub. I shot this around 10:45, yet it didn't make it down to Winona until about 3 in the afternoon. Description: Four SD40-2 lead 270 down the mainline with 155 cars in tow as it heads towards Marquette, IA. This was an awesome chase and the engineer would notch it up everytime he saw us. Josh and I sure did well this day! Special thanks to Gordon for the info on this! Description: One of my better catches of the past few weeks! Two former BN SD40-2s getting ready to start moving out of the Andover siding AND a little bit of sunlight in a sea of clouds too! Special thanks to Andrew Osborne for the heads up on this. Description: After being in run eight for the entire treck up Shortline Hill, the four EMDs start to slow down before taking the light at Merriam Park. Description: Three bandits and a single Soo GP38-2 make up todays 581 as it sits in Hastings. The ICE unit has been working Hastings for a while now. Power for this 581 was Soo 2057, 4415, 2041 and 4512. Talk about an awesome lashup for 2012! A huge thanks to Josh D for the heads up on this guy! Description: A nice looking IC SD40-2 leads todays L517 into town with a BC Rail C44-9LW and CN C44-9W trailing. 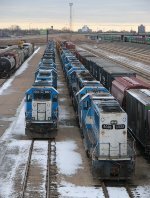 I love seeing the IC SD40-2s back on this job, and I hope they hang around for a bit! Description: Frank opens up the throttle on the 20+ car Monti Local as it approaches Brooklyn Blvd. 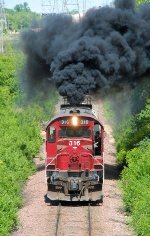 I have NEVER seen an EMD locomotive smoke this bad before, it was a sight be seen to say the least! Description: In a scene right out of the lates 80s, a pair of matched bandit Soo MP15ACs head down the Camden line to switch out and serve the various customers. The train is just coming up to 33rd Ave North in this shot. Description: Two matched former Conrail SD40-2s bring a crude oil train up and through University. Never in my life did I think that I would see a pair of these get out of helper service and make their way to MN. I ended up getting this guy in three spots despite the poor condition's out. 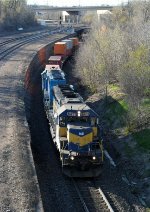 Description: Train 632 roars down the main as it passes through the small town of Dakota, MN with a trio of ICE SD40-2s. Thankfully the sun popped out for literally seconds, giving us the light we had been wanting all day. Just seconds before the train rolled through, people were walking along the main and ignored our shouts warnings to them of an oncoming train. Description: Kudos to Frank for giving me a bit of a smoke show as the Monti Job came up to Rogers with a few cars bound for Albertville. This is really cool, and has many good photo ops to be had. Description: The Hauler crosses Madison St as it makes the four mile treak back to Fordson. This is back when we had snow, and before it all melted. Description: A trio of C40-8s rest at New Brighton before heading out of town on L516. 517 came into town with just two C40-8s, but later in the day the Chippewa Falls Job came in with the 2125 making for this interesting lashup. This photo is stock, nothing at all has been edited on it either. Description: The Rosepost Local, LTB-85, rolls outta SSP with the mighty Mississippi in the background, as well as downtown STP. Description: Minnesota Transportation Museum's annual power and equipment move from Osceola to Jackson St rolls though Cardigan ahead of L517. Thankfully, the sun came out just long enough to like the power and trees up a little bit! Description: Todays L517 rolls into town as seen at Cardigan Jct. I really like those CN 89XXs leading the way. Description: Todays Sand Train, Job 99, rolls downgrade as seen from Lexington Ave. There were three units on the head end, and two on the rear as well. If only the 71 was leading the way...still an awesome lashup to say the least. Description: Five Minnesota Commercial units bring today's sand train, Job 99, down past the Bluffs and towards BNSF's Bluff Yard. Sure was a sight, and seeing the M636 mid train was awesome as well. Description: The H-GALNTW rolls under Maryland Ave in run 8, making not only for an awesome sight, but sound as well. What an amazing lashup for 2011! Description: Soo 4451 throttles out of Lake City, leading the days 580. It will take the siding at Lake View so Amtrak can pass before getting a route all the way to Tower CK. This is the highest original Soo GP38-2 that is still in Soo paint. Description: L517 rolls over the High Bridge that soars above the St. Croix River just north of Stillwater. I have been wanting to get this shot for years. Big thanks to Nick Benson and Dan K for their help in finding this spot! Description: CP 271 cruises down the ICE mainline with a former MoPac unit leading the way. This is just north of Marquette. Description: CP 277 rolls down the DM&E main as it goes through what local railfans call "Rivards Curve" before starting up Stockton Hill. Description: A quartet of 1960s power brings todays 277 as it nears the small city of Stockton. The blue and yellow really stands out against the green. Description: L516 heads out of town in the last days light as it comes past Island Lake and up towards Victoria St. Description: Train 170 continues its way down the ICE line as it rolls through the small town of Brownsville with all five units online and working. Description: CP 281, AKA the Fast Ford, roars though Tower CK and is just about to duck under Pelzer St in Winona on a beautiful summer afternoon. Description: On the way down to Winona, we decided to see what was going on in Mendota on the PGR, thankfully, we found this guy working. Description: CP 271 comes through Saint Paul Park with a four pack of blue and yellow SD40-2s for power in perfect light. To make it even better, the units were front-back-front-back as well. Big thanks goes to Josh Dulak for the heads up on this one! Description: Soo 6027 leads an empty Dresser Turn through Saint Anthony, MN on a clear July day. Trailing the leader is a CP SD40-2 and GP38-2. Back in the day, this was the Soo's mainline and was double tracked. Description: Today, the Commercial made a special trip down the Hiawatha Line to bring 25 cars into storage. Here we see the 2002 at what is literally the end of the line these days. Even though it was pouring rain, me and some other railfans were out shooting this very rare and neat move. Picture was taken just south of 45th St E and Hiawatha Ave. Description: Well, this was unexpected! The Hauler stopped right here because of an extra rider two cars back. If you look closely, you can see a little kid hanging on the side of an auto rack right above of the conductors head. Description: The HAT rolls over the Mississippi River with a set of matching Candy Apple Soo SD60s. Description: The Ford Hauler heads to the Ranger Plant with parts to make the last of the Ranger line as a Ford Ranger Crosses over on W. 7th St just before the gates went off. I was hoping to get a Ranger and Ford Hauler together in one shot. :-). Description: After clearing the highline switch, L506 notched up and started its climb up grade back to New Brighton. Description: CP 182 slides downgrade in heavy dynamics as it rolls through Westminster. NREX 6301, a former Milwaukee Road SD40-2, trails the ICE 6411. Description: Four blue and yellow DM&E and IC&E units roar over the flooded Crow River in Rockford as they lead an awesome looking 171 west towards Glenwood. The lead unit is the DME 6052 followed by DME 6097, ICE 6416, and ICE 6403. I never thought I would ever see something like this on the Paynesville Sub. Kudos to Todd R for showing me this spot.